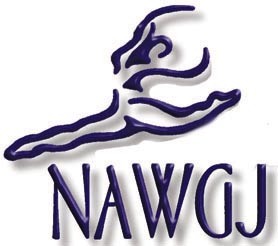 Navy Blue & White Antron Warm Up Suits with NAWGJ Logo on each piece. Sized for both men and women! Collar Shirt, T-Shirts and Sweatshirts also available. Outer shell of Antron nylon fabric with laundered finish, yoke shoulder design with vented back, lined in polyester mesh, front zipper zips to top of collar, elastic cuffs and bottom band, reinforced slash front pockets, water-resistant, machine washable. Antron nylon fabric with laundered finish, with covered elastic waistbank with inside drawstring, two side pockets, elastic leg cuffs with side zippers, water-resistant, machine washable. Antron nylon fabric with laundered finish, long baggy cut, 6 inch inseam, two side pockets, covered elastic waistband with inside waist drawstring, machine washable. Shirts are Jerzee brand 50/50 blend and are available in adult sizes. It's finally here! Comfortable warm up suits, including walking shorts, that Judges everywhere will love. Cut for women with tailored arm holds, welt collar, & double needle bottom hem. Inner fabric is extremely soft and comfortable. 60/40 cotton poly blend allows for easy care & minimal shrinkage. 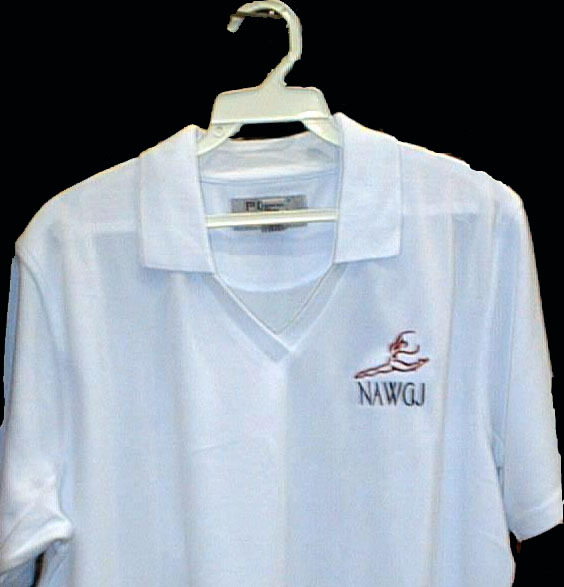 Embroidered with NAWGJ Logo.